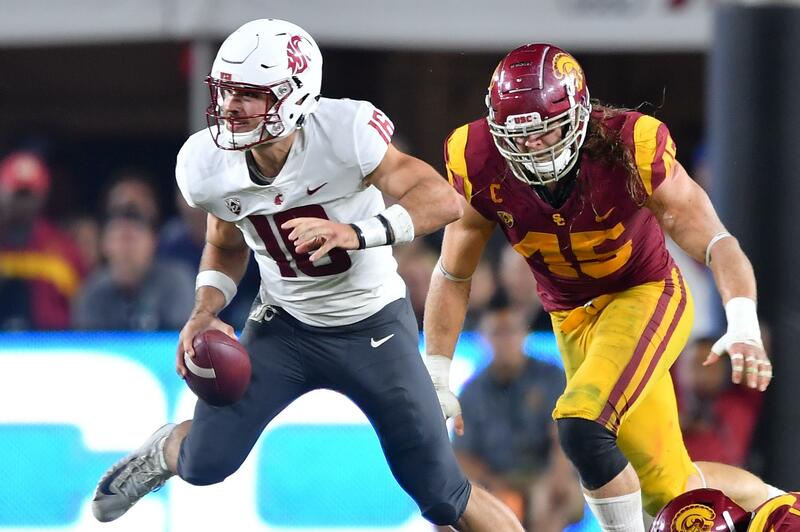 UPDATED: Wed., Sept. 26, 2018, 5:42 p.m.
Late in the fourth quarter of Friday’s game between USC and Washington State, Gustin, a senior outside linebacker for the Trojans, delivered a jarring hit on Minshew after the Cougars’ quarterback released an incomplete pass on first-and-10 from USC’s 25-yard line. A penalty would have advanced WSU, trailing 39-36, to the Trojans’ 10-yard line with less than 2 minutes to play. Gustin appeared to lead with the crown of his helmet as he collided with Minshew and jolted the QB to the turf. According to Scott, a team of replay officials at Los Angeles Memorial Coliseum gave the play a thorough examination, as did the crew of experts at the Pac-12’s command center in San Francisco. “So you can certainly assume that play got a lot of looks, not just from the replay booth at the stadium, but we’ve got our command center back in San Francisco with our head of officiating and a bunch of experienced replay guys, who absolutely would have looked at that play,” Scott told the AP. Every play is reviewed, Scott said, and the commissioner discussed Friday’s hit with the officiating team. But the conference stood by its initial ruling and determined Gustin’s play did not fall under the targeting umbrella. All plays are reviewed by three crews during a game – the on-field officials, those stationed inside the replay booth of the press box and experts at the conference’s command center in San Francisco. The Pac-12’s coordinator of officiating, David Coleman, and other staff members typically review disputed calls on Monday of each week, Pac-12 vice president of communications Dave Hirsch said, but the conference doesn’t comment publicly on the individual judgments made by officials during a game. Published: Sept. 26, 2018, 12:29 p.m. Updated: Sept. 26, 2018, 5:42 p.m.